this post is sponsored by melissa & doug. it contains affiliate links. keep scrolling down to check out the amazing GIVEAWAY at the bottom of this post: $130 worth of toys could be yours for FREE – that’s a great way to save your money!! my kids are still pretty young, but they are becoming increasingly aware of money and how it can get them what they want. they know that if they want a toy or some candy from a store all they need is money. they know that if we run out of their favorite fruit snacks all we need to do is give the store some more money and it’s theirs. what they don’t yet understand is that money has to be earned and there is not an endless supply. my kid: mom! PLEASE can i get this awesome race track?! it’s only $80.00! me: hmm, i don’t think so. we don’t have money to buy that today. my kid: but mom, you get to put whatever you want in the cart and we buy it – why can’t we just buy this too? me: “whatever i want” is called groceries and we’re buying food for us to eat this week. i only brought enough money to buy the food that we need, not enough for toys, too. my kid: then why didn’t you just bring more money? …and on goes the conversation. it’s happened a few times since then. i knew we had to teach our children not only about money itself but how we obtain it and how we need to be responsible with it. i gathered a few empty baby food jars to make a sorting station. 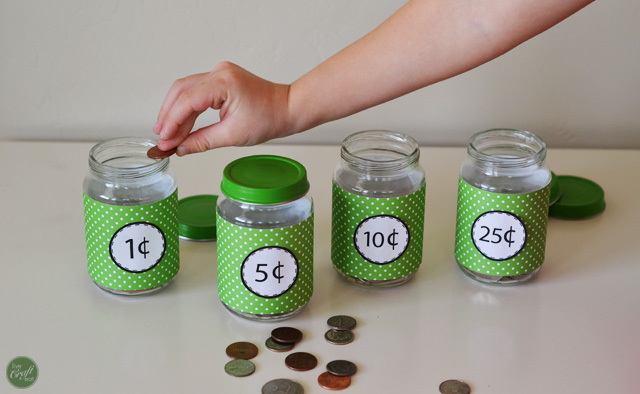 each jar has a label for each of the different coin values (you can download the labels here). we dumped out a big jar of coins and the sorting began. we identified the coins by their color, size, the picture on the front, the picture on the back, and the number value on each one. …and so on. then we did the same thing but closed the 10 cent jar, and then again with closing the 5 cent jar. this activity is great because while they think they’re just learning about money identification and sorting, they’re also learning about the value of money and math at the same time! my kids actually know a surprising amount about composing and decomposing numbers through playing the shut-the-box game. it’s an excellent game/tool that helps them think about numbers in the same way that this sorting activity does. up until now it’s always been the case that when my children need something i give them the money to buy it or i just buy it for them since they’re too young to earn money themselves. they are also gifted money from relatives for their birthdays and other holidays. i think they have the idea that money is just given to us, their parents, just as it’s always been given to them, thus if we need more money to buy them toys, we should just ask for more. obviously, this is not the way in which we obtain money. money is earned through hard work over a long period of time. to demonstrate this concept, i grabbed a basket and filled it with various items from the dollar store and with things i already had around my house – a few small toys, a couple treats, stickers, and some coloring & activity books. i printed off some price emblems that you can download here (colored dot stickers would work great, too) and assigned a price to every item. …and so on. we purposefully didn’t use the same increments used on the prices of the prizes themselves. we also made the harder, less-frequent jobs worth more while the things they need to do on a day-to-day basis worth less. this makes them have to do more than one job to earn enough money to buy what they want. it’s not instant gratification. once they have enough money to buy what they want we use the play money set to make the transaction. we give them their change and they continue saving their money and doing their jobs in anticipation of buying the next prize. activity #2 is a great lead up to this activity. since we had just talked about how they had to work to get paid a certain amount money, it was easier to talk about the money that their parents make. we also talked about where all of that money goes – it has to pay for cars, our house, our food, our clothes, etc. we explained what a budget is and how much money we allot each week to spend at the grocery store and how once that money’s gone, there is no more. anything we want to buy after the money is gone will have to wait until another time. for this activity we used a shopping cart a wooden play food pantry set and a wooden play food fridge set . these sets include items that we buy frequently at the store so it was easy to come up with a grocery list that looked similar to one we would actually use on a regular basis. we assigned prices to each item. 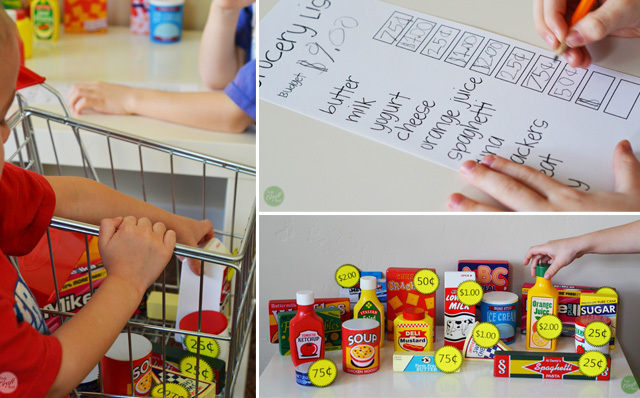 then we wrote out our grocery list (download the blank printable here), starting with a budget of $9.00 (we gave them $9.00 from the play money set to use) and left a space to write the price of each item. we added two spaces at the bottom for “treat” and “toy” and added their prices as well. then they were off to do their shopping! as it happens, when they got to the “treat” and “toy” portion of the list they had to make a choice – one or the other. they didn’t have enough money to buy both. i love that this demonstrated the same situation in which we often find ourselves when we go to the actual grocery store together…we buy everything we need first on our list and then sometimes we do have enough money to buy something extra, and sometimes we don’t. i think this role-play has helped them to understand that. since doing these activities with our kids, the conversations at the store have been quite a bit different. what a difference! 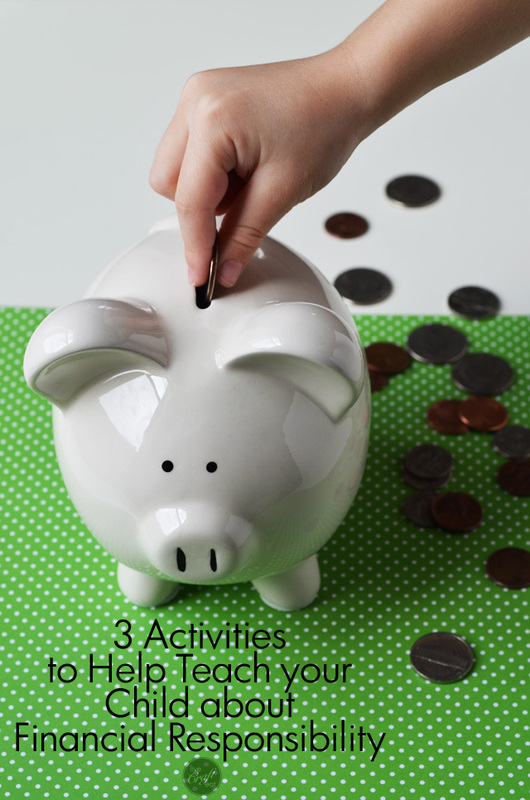 this is just the tip of the iceberg when it comes to learning about money and saving, but for being young kids, i hope these activities help them want to work hard for their money and to spend within their means. a lesson like that will no doubt serve them well in the future as they work in jobs outside the home, budget their money, and have to save for things worth more than $0.25! you’ve probably read this post because you’re interested in saving money yourself and you want to teach your kids to do the same. 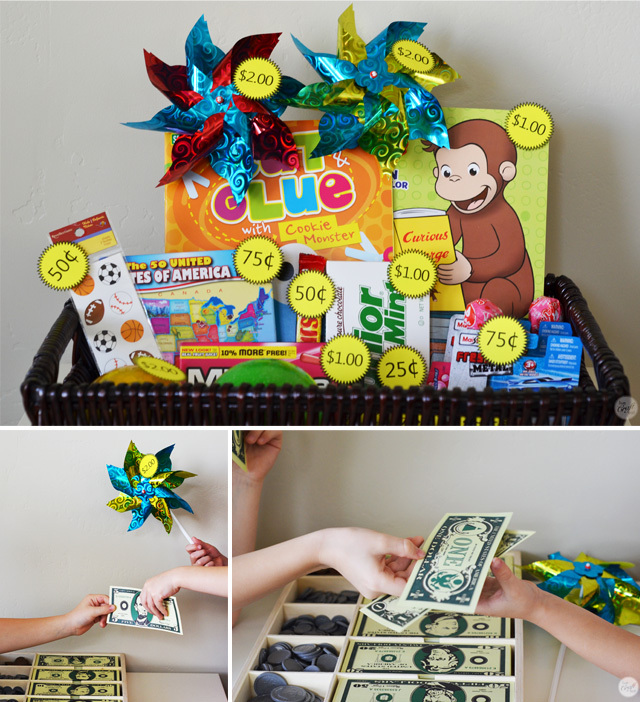 here is the perfect way to do both: enter this giveaway to win all of the Melissa & Doug products i used in this post – you could save money on toys for your kids and your kids will learn how to save money by using these products to follow the activities above! all you have to do is follow the prompts below! good luck!! Oh my goodness, what an awesome giveaway! We have one or two Melissa and Doug toys — puzzles — and my siblings have always loved them. The quality is AWESOME! 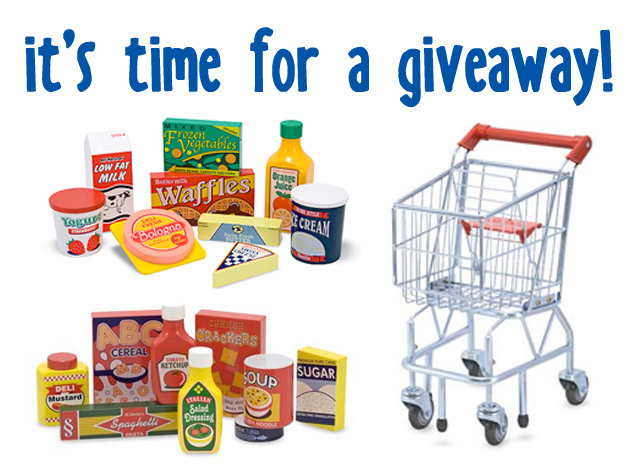 My little sisters (7, 5, & 3) would LOVE to play with this whole grocery-store giveaway. That is soooo cute! Geez, *I* would’ve love to have something like these when I was young, lol! thank you and good luck to everyone entering!